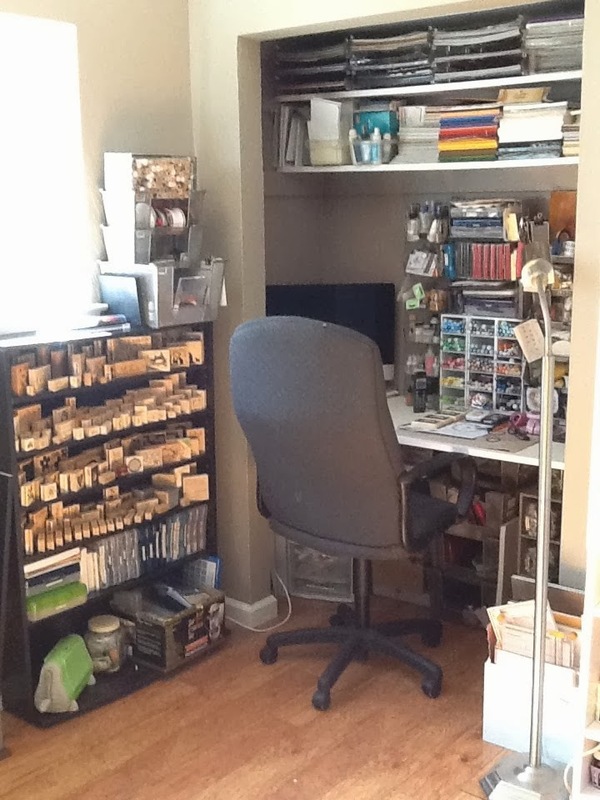 After Hours Stamper: New Year's Resolution: Time to get organized! New Year's Resolution: Time to get organized! Anyhow, time to talk stamping : ) This year I have decided that organizing my stamps is long over due. Right now my stamps are stored in CD cases, but I ran out of cases (and room ) so many of my newer sets are still in their wrappers stored here and there (and sometimes who knows where). And while I have started to index my stamps many times, I have never really finished the project, but this year things are going to be different. 1.) One of the first things you should do this year is to sort through all of your stamps and supplies. Identify the stamp sets and supplies that you rarely use (if at all) and put them aside for a few days. My pile (and I just started this process yesterday) contains sets of stamps that are very small images, country looking stamps and some images that I know I will never use (if I haven't used them in two years when are they going to be used?). After you have waited a few days, go back and look at the stamps and supplies you have set aside. You will be able to determine if you really want to get rid of the stamps by now. I have decided that clearing out old stamp sets I do not use will allow me to save some room for newer sets that I will use. Now, this is the hard part. After a few days go back through the stamp sets that you decided to keep and find some more stamps/supplies that you can either sell or give away. This two step process works very well and will allow you to free up some space for newer sets and supplies and maybe even give you a bit more space in your stamping/crafting area. Another hint: this is a good time to change your storage system as well. I unmounted almost all of my stamps a while back and am SO glad that I did! Right now my stamps are stored in CD cases, and I am in the process of labeling the cases and color coding to match their category, ie, green will be floral stamps, brown will be trees and leaves and so on. The Angel Company: Uses CD cases, and has some good advice. Panels for unmounted stamps: Pretty good prices on these panels for three ring binders. Large clear containers: I think these are great, easy to use and store a fair amount of unmounted stamps. Crafty Storage: I have this site linked on the "best of" links and it is worth posting again, and again and again. GREAT ideas on stamp and stamping supply storage. 2.) Now that you have sorted through your stuff, now is the time to index your stamps. Yes, I know, this is a long process and it is boring, but it is also rewarding and will make your stamping time much more productive. You can also get ideas about what categories to use from a number of companies that sell stamps, simply look at the listings of their stamps to get ideas on what categories you might want to include in your list. Remember, this is your list and you know what types of stamps you have so make your list work for you. Once you have sorted your stamps out by category you need to decide how to index your stamps. I have decided to stamp the images in each CD case on a 5 x 7 index card, write the name of the label on the card, color code the card (to match the color of the category) and put the cards on a binder ring so I can flip through them quickly. (I will take a picture later today and update the post). NOTE: You also should try to write down the manufacturer of the set you are indexing as well as when you purchased the set. Two things: You really need to have some sort of way to sort quickly through your stamps when you are working on a project and the best way I have found is to have your images stamped and indexed. I did try a method where I stamped the images on large pieces of paper and put them in a binder, however I found that (for me anyway) it was harder looking through large sheets of images and I also had trouble updating the binder. Using the 5 x 7 cards allows me to easily flip through my images and find what I need, also, when I get rid of a set all I have to do is find the card and throw it away. Now, the one thing that I am struggling with is how to index words/quotes contained within sets that have images. What I might do is index everything by set first, and then the sets that contain words will get a second colored dot as well. For instance, if a botanical set has flowers and a quote or word then I will give that stamp a "green" dot for botanical and then another color for words/quotes. NOTE: many images fall into more then one category, trees can be "trees" but they can also be "Christmas/Holiday." Cross indexing (stamping images for more then one category) is really the best way to find what you need, but it does take more time. Instead of overwhelming yourself, start with a simple index of everything you have, and eventually you can take the time to stamp your images a second and third time for other categories. The most important thing is to get your images indexed at least once. Eventually I will create an index for all of my sets that will have images stamped into more then one category, for now I want to at get the sets indexed (which means stamping every image I have) at least once. Let me explain: if you have a floral set that also contains words and or quotes you should stamp the entire set and index as "floral" and then stamp the words/quotes and index them in your "words/quotes" category. By stamping images more then once you will find that you can quickly access whatever you need, whether it is an image or a word/quote. Again, I will post pictures later today or tomorrow of exactly what I mean. 3.) After you get your stamps organized, don't forget about your other supplies. Now is a GREAT time to get rid of anything you haven't used in the last year (you want to make room for some of that new stuff you know you will purchase this year). Go through your ink pads, pens, paper, embellishments, glue, stickers and get rid of anything that has been sitting there unused. You can list them for sale on Ebay, hold a garage sale, give away to your friends, hold a "swap" with other stamping friends (everyone brings their unused stuff and swaps for things they will use), donate your supplies to a local school or church, just make sure to clear out what you don't use! I have a number of supplies I don't use, so this year I am going to sort through ALL of my supplies and pare down to the things used on a regular basis: copics, watercolors, H20's, chalks (do I really need eight different sets of chalks?). 4.) Last, but not least, make sure you use what you have this year! Instead of buying more paper (which you have to store), use up what you have and then get more paper. I have far too much 12 x 12 designer paper, if it isn't getting used this year it is going to be sold/donated to make way for paper I will use next year. Now I know it is hard to not buy "new" stuff, but given our current economy why buy more of what you already have? Save your money for new supplies that you don't have instead of adding to your stash of supplies that lead to frustration. Ok, so this is the year to get organized! If you have any good ideas for organization, please post in the comments section, we all want to see your ideas! Have a great day! Remember, I will post some pictures later today (or this week) of other storage ideas and my stamp indexing system. Thanks for this- I am working on moving my crafting supplies to a room downstairs- I would like to index- and have lots of categories- and my thought on cross indexing is overwhelming! Also, I have lots of stamps from years ago- which I will not get rid of- that I have no idea what company made them......Great article!